Whenever I hear someone mentioning Isabeli Fontana I immediately draw a connection to Victoria’s Secret. Maybe I am wrong to relate the Brazilian model to the lingerie brand only, but this is what, in my opinion, makes her so famous today. The beauty is one of the brand’s Angels which doesn’t surpise me at all. She is beautiful, seductive and charming – seems like these are the key features for a model to become chosen by Victoria’s Secret. But Isabeli goes beyong posing in gorgeous bras. She stars in various campaigns and lookbooks and H&M trend update is one of her works. Isabeli was lensed by Andrew Yee of Atelier Management. The model posed against a plain studio background in a range of adorable winter outfits. Every single look makes my mouth water and my hands shiver, as I recount my monthly budget. Checking out lookbooks like this one never works out for me, as I immediately fall in love with the presented pieces, giving way for my shopaholic instinct. I am pretty sure, you will get what I feel as well. There is no way one can stay untouched by the striking ensembles that Isabeli sports from one shot to another. All of them feature a great style as well as deep fashion taste,which will make any lady look even more stunning and appealing. Knit sweaters in various colors, pants, leggins and skirts along with saucy coats and dresses all together create stylish looks, impossible to resist. Besides, each of the outfits is accessorized with a pair of trendy boots, a bag or some jewelry pieces. In other words, you won’t get disappointed by the lookbook H&M offers this time. My favorite look is the one featuring a fur maxi vest over a white shirt with a rabbit face embellishment in the middle. Black leggins in a beautiful pattern match the suede booties with fur edges. This particular outfit is a very rare case when you don’t need any accessories to style it with. The rhinestones on the shirt as well as the active print on the pants are pretty enough here. This ensemble is perfect to wear to an informal party with friends or even to your working place, in case you are blessed to have no dress code. 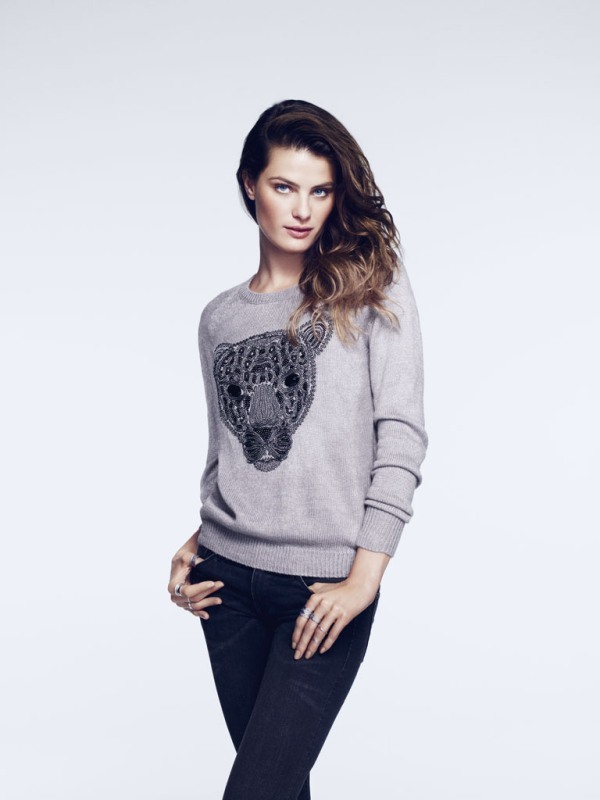 H&M did a right choice tapping Isabeli Fontana to star in the latest lookbook. The Brazilian goddess looks gorgeous regardless of what she wears, especially when it is the collection of the Swedish high street fashion brand. Check out the gallery for more looks of this great collaboration.